A writer and a poet, Dr. Wills is dedicated to the ministry of encouragement and helping people experience hope, wisdom, and faith in their spiritual journey. She has written for a number of publications including The Journal of the Fort Smith Historical Society. She previously served on the board of the Arkansas Community Foundation. Dr. Wills makes her home in the foothills of the Ozark Mountains in Fort Smith, Arkansas. Oswald Chambers in his book, Christian Disciplines, says that the “unexplained things in life are more than the explained.” I recall the time I flew to Phoenix to be present for the birth of my sister’s first child. Betsy is my baby sister, fourteen years younger than I am. I mothered her from the moment she was born. She was the flower girl in my wedding and she made me promise to step on every petal she threw on the floor. I was there as Betsy gave birth to her first child, a severely brain-damaged son, a son named Aaron. A baby was born. I grieved at the stillborn joy. I recall standing in the hospital hall, peering into the nursery with my head and hands helplessly pressed against the glass. I remember back at her room standing at the head of her bed with my hand on her head while she kept repeating, “The name of the Lord is a strong tower; I will run to it and be safe.” I grieved until I was sick. I wanted a miracle and not the trial. I beat down heaven’s door until Aaron died at age four and a half. Aaron could never see, hear, or respond to anything except pain. At times he seemed to be a bundle of blank agony. Aaron had a bushy head of uncontrollable hair, and onto that head, his parents put earphones. Aaron heard music, and Aaron heard the Bible read through twice. When Aaron died, the Gift that pressure-tested our faith went to be with his Creator and his God, where he may have been all along. I went with Ed, Betsy’s husband, to select a cemetery plot. As we went out the door, Betsy said, “Find a tree.” The Lord gave us the last tree in that Arizona cemetery. Aaron’s life and death raised questions. My faith had been challenged. Why didn’t God heal the firstborn of an “upright” man and a praying mother? Why didn’t God protect Aaron’s birth? Why does God heal some people and not others? I was not angry at God. I just wanted to understand. In seeking to understand, I realized that somehow I wanted God to prove Himself or be more predictable. God wanted me to know that I, a fallen child with a finite mind, will never comprehend His ways. He wanted me to know that He understands me and my wobbly faith. When we ask why or say we don’t understand, we are reminded of the Last Supper when Jesus sat before His disciples with the bread and the wine and told them a mystery. He told them to eat the bread and drink the wine because it was His body poured out for them. He did not tell them to understand or to make sense of His strange request. He said, “Take and eat.” They did not understand. There is much we do not understand. The scriptures say God’s thoughts are higher than our thoughts and His ways are past understanding. But God says we can know Him. He longs to know us in a personal way. He invites us to contemplate His mysteries and to experience the power of His resurrection and the full measure of His grace. Faith is a dynamic process. The endurance and strength that comes from pressure-tested faith does not come overnight. Betsy and Ed were not okay all of a sudden because they were Christians and loved the Lord. They grieved and questioned why and to what purpose this deep and lingering pain had been part of their lives. It was by faith they testified that the Most High God was their God. It was by faith they believed that He would lead them through the wilderness to His place of certain good and He would be a light for them in their “valley of the shadow of death” (Ps 23:4 NASB). In the process, from time to time, God gave Ed and Betsy small gifts of comfort, a small song of joy. When Aaron died, Betsy and Ed were in Arkansas visiting me. My sister Shawn called saying she was at Betsy’s house because the caregiver had called to tell her Aaron was not doing well. Shawn, a nurse, went to check on Aaron. Then she called Aaron’s doctor and Betsy. About ten minutes later, Shawn called again. “Betsy, he’s gone.” I remember clearly the primordial sounds of parental grief. We all immediately flew to Phoenix to prepare for a funeral. After the funeral, Betsy and Ed returned to Fort Smith to pick up their van and drive back to Arizona. Along the way, they stopped to eat. Isaac, their two-year-old son, was asleep. Not wanting to wake him, they parked the car in the front of the restaurant bay of windows so they could see him when he awoke. They had just sat down when Isaac popped up and Ed went to get him. When he got settled in the high chair, he had a strange look on his face and Betsy asked him if he was all right. He said, “I just saw brudder.” Obviously, Isaac had a dream. “What was brother doing?” Betsy asked. “He was running and singing and playing,” Isaac replied. Isaac’s dream was a comfort, a reminder of what is truly real behind the veil. Every once in a while, God draws the curtain and lets us see. He gives us reminders that though we are tethered to this earth there is another realm of reality just as real. Every once in a while, He lifts the veil. He thins the space between heaven and earth. He lets us experience the “thin place.” He helps our faith. And a dimly burning wick He will not extinguish. When they know nothing else. And the heart is the heart of the matter. Let Your light shine, shine in a humbled heart. When I bend beneath the gale. I will shine and bless the poor in spirit. In the Celtic tradition, a “thin place” is the place where the veil that separates heaven and earth is nearly transparent. It is a place where we experience a deep sense of God’s presence in our everyday world. A thin place is where, for a moment, the spiritual world and natural world intersect. There are moments when we do feel the divine breaking through into our world. We feel unified and connected with God. It is not an intellectual knowing, it is felt in the spirit. It can be a sudden momentary awareness or profound unexplainable experience. I would like to share a few “thin place moments” with you and encourage you to have eyes to see the gifts of thin places. The phenomenon of a place where the physical and natural everyday world merges into a thin line is well rooted in biblical history, but it was the Celts who first gave the descriptive phrase “thin place” to it. 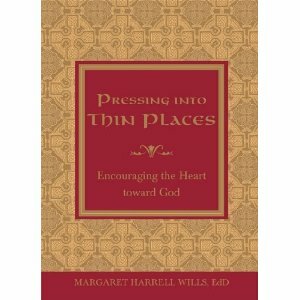 I first understood the idea of thin places when I heard a minister from Tulsa speak to a group of ear, nose, and throat surgeons in Washington, D.C. His point was that he as a minister and they as physicians were in a unique and privileged position to witness “thin places” because both the physician and the clergy dealt in the realm of life and death. He gave an indelible example of one of his experiences. He said he had been called to the hospital to pray for a dying woman who was in a deep coma. He went in and although she would not be able to know or respond to his presence, he went over and stood at the foot of her bed and prayed for her aloud. He began, “Our Father, who art in heaven . . .” About midway through the prayer, the woman, without waking up, began to join in with him: “Give us this day our daily bread . . .” She finished the prayer and died shortly thereafter. He knew he stood on the line of a thin place. Another example was told to my husband and me by his senior partner when his wife died. She was in the hospital and the family had been called in because her death was imminent. As Charles and his two children sat by her side, she left her body in the early morning hours. Sherard, the daughter, said to her brother, “Chuck, did you see it?” He said, “What? I did not see anything.” She then asked, “Daddy, didn’t you see it?” He said, “No, baby, I didn’t see anything.” She said, “Just as mother died, I saw a mist rise from mother’s body, float to the ceiling, and disappear.” Sherard witnessed a thin place. Thin places come in different ways and some can be subtle. I call them “Garden of Eden moments” because they remind me of the way things must have been in the Garden of Eden when the earth was perfect and at peace. I think we have all experienced them, kind of a time of unified joy. The bounty and beauty of nature can bring such joy: a sunrise or sunset, the coming of spring, or a deep winter snow. Moments of a unified spirit can also come within relationships. One such Garden of Eden moment came when Paul and I went to Disneyworld with our children and grandchildren. After a long day of activity at the park, we headed back to our hotel room on the bus. Paul was sitting next to me with his arm around the back of the seat touching my shoulder. Across from us were our two sons and their wives, talking quietly and content with each other. Their children were curled up, lying in their laps and cradled in the crook of their arms. For one brief moment, I experienced the way it must have been in the Garden of Eden when peace and joy ruled, when all was perfect and everything was the way it should be. I believe I had a less than subtle thin place experience when I went back to graduate school. Most days, I drove seventy miles to northwest Arkansas to attend the University of Arkansas in Fayetteville. Early on, almost every day, I would wonder what my brain was thinking when I began this task. My brain was rusty, and besides, I was driving a stretch of mountain road that was known for death-producing accidents. I remember questioning if this had anything to do with God’s will for my life. I reasoned that I could be using my time doing something more for Him or more beneficial to others. Then one day I was coming out of a history class and heading across campus. I was somewhat protected under my umbrella but the rain was coming down in sheets and I was wading through puddles of standing water trying to navigate to my next class. When I was almost there, I saw a young man under a tree, sitting on a bench. His umbrella was propped up beside him, and despite the shelter of the tree, he was getting soaked. His clothes were wet and he sat with his wet head in his hands, sobbing, his shoulders shaking hard. I walked off and left the young man on the bench in the pouring rain. When I arrived at my building and headed up the steps, I turned around to look at him once again. He was gone. I did not see him walking away. He was just gone. I turned and walked to my class. But I was mystified. My thoughts were, Where did he go? Then I wondered if maybe he was an angel. Then I thought, Maybe I was his angel? I did not know. All I knew was that I had experienced a special moment that had a meaning, a thin place. As I thought about the experience, the Lord began to speak. He reminded me that His work is everywhere, and everywhere we are, in every situation, He has plans for us if we have eyes to see. God reminded me He is not just in some planned “spiritual” activity but He is in the everyday sacred mundane of our appointed days. It is in the flatlands of our everyday routine that we need to remember our thin places. We need to be aware that God has spoken and still speaks. Remembering is one of our greatest challenges. We forget too easily. Here on the mountain I have spoken to you clearly. I will not often do so down in Narnia. Here on the mountain, the air is clear and your mind is clear; as you drop down into Narnia, the air will thicken. Take great care that it does not confuse your mind. And the signs which you have learned here will not look as you expect them to look, when you meet them there. That is why it is important to know them by heart and pay no attention to appearances. Remember the signs and believe the signs. Nothing else matters. We are graced with thin moments from time to time, some profound, some subtle. They sneak up on us. So let us keep our eyes open for the gifts of the thinning of the veil as we walk on the mountains. And then let us remember the truths in the flatlands and in the valleys.